Google Nexus 6 isn’t the perfect handset and has seen its fair share of problems. Previously, several users reported that the back cover of their devices are peeling off. The issue resulted due to the battery swelling in most cases, but it’s seems this time, it has gone far beyond swelling. 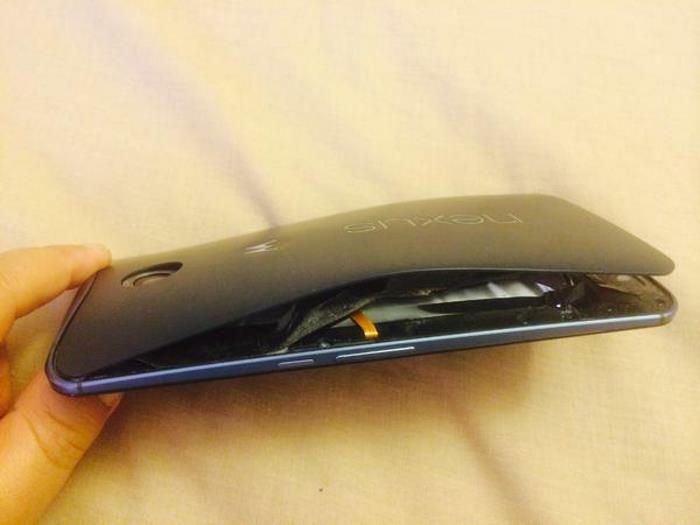 A Nexus 6 user reported that his battery exploded, ending up in big damage to the phone as seen in the image above. Thankfully, there was no fire involved or any injuries, but the phone is in an unusable condition at the moment. What’s even more surprising is that the phone was not being used or on charging which may cause the battery to get a little warm. This shouldn’t cause the battery to explode so there must be an internal hardware fault which resulted in such an outcome. This is not a small issue, and we’ve heard about instances where the battery exploded and caught fire so it’s time for Motorola to check and rectify the issue, and if there are any other users experiencing battery problems, they should get in touch with the company at once to make sure it doesn’t happen again.